A mysterious E. Coli outbreak outbreak of unknown provenance has now spread to five states, and infected 96 people, the CDC disclosed on Tuesday. As of April 8, the states include Ohio, Kentucky, Tennessee, Virginia and Georgia, according to law firm publication the Food Poison Journal. The source of the outbreak has not yet been determined. Though late last year, another E. coli outbreak prompted supermarkets around the country to destroy supplies of romaine lettuce after the outbreak was traced to tainted lettuce tied to a California farm. 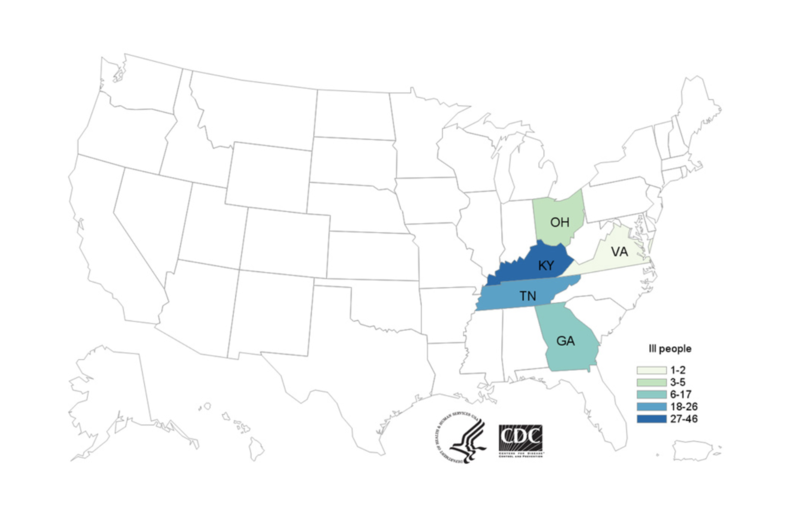 Illnesses tied to the current outbreak were first reported on March 2, 2019, to March 26, 2019. The infected have ranged in age from 1 to 81 years, with a median age of 17, just over half of whom have been women. No deaths have been reported, but 11 people have been hospitalized. State and local public health officials have been interviewing the victims to try and determine what they ate and how they might have been exposed to the virus in the week before they fell ill. In addition to locals, the US Department of Agriculture’s Food Safety and Inspection Service, the US Food and Drug Administration, and the CDC have all been investigating the outbreak. "This investigation is still ongoing, and a specific food item, grocery store, or restaurant chain has not been identified as the source of infections. State and local public health officials are interviewing ill people to determine what they ate and other exposures in the week before their illness started," the CDC said. People infected with E. coli typically start experiencing symptoms two to eight days after exposure, according to Newsweek. Most people take a week to recover. While the infection typically doesn't require hospitalization, E. coli can lead to a type of kidney failure called hemolytic uremic syndrome, which can be deadly. Symptoms include bloody diarrhea, as well as cramps and vomiting. Some might experience a low-grade fever. People can protect themselves by washing their hands and cooking meat, vegetables and fruit thoroughly. They can also avoid smoking street marijuana, which has recently been found to contain a surprising quantity of human feces, the NYP reports.